The record is made up of 1 file (208 folios). It was created in 2 Jan 1924-13 Aug 1925. It was written in English and Arabic. The original is part of the British Library: India Office The department of the British Government to which the Government of India reported between 1858 and 1947. The successor to the Court of Directors. Records and Private Papers. classify Nepal to say nothing of one or two of the otters. This matter we are taking up in the right qmrters. Political Resident A senior ranking political representative (equivalent to a Consul General) from the diplomatic corps of the Government of India or one of its subordinate provincial governments, in charge of a Political Residency. -in the Persian Gulf Historically used by the British to refer to the sea area between the Arabian Peninsula and Iran. Often referred to as The Gulf or the Arabian Gulf. . 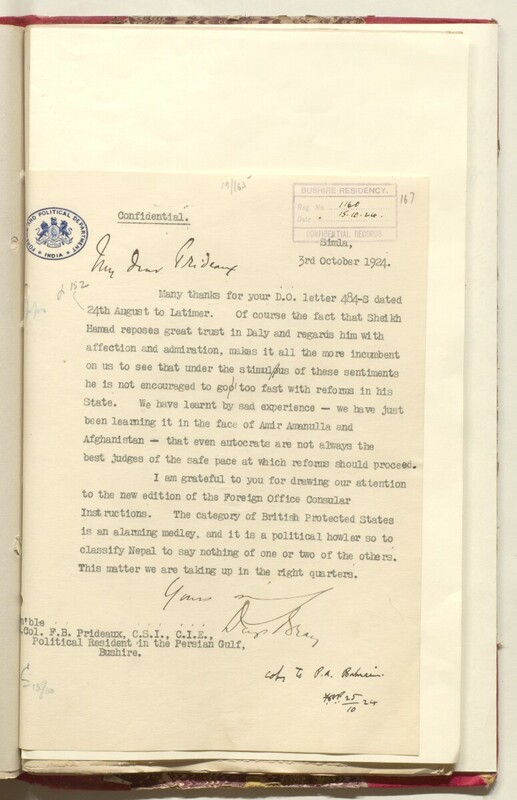 File includes correspondence related to a number of topics including a request to the Governor General of Sudan for a copy of Sudan's Penal Code, correspondence between Abdul Wahab Zayani (Isa bin Ali Al Khalifa’s Attorney in exile in Bombay) and the Political Agency An office of the British Government and, earlier, of the East India Company. in Bahrain, reports of Sunni violence against the Shia community in Bahrain, discussion regarding the need for a levy corps in Bahrain, discussion on where and how Shaikh Hamad bin Isa’s younger children should be educated, correspondence between Bushire, Bahrain and the Government of India regarding the extent of reforms in Bahrain and the nature of Britain’s role in the country. The movements of an Egyptian journalist (Ahmed Rifaat) in the region are also mentioned as are several other matters in brief. The file also includes a letter from Herbert Samuel, the British High Commissioner in Palestine that reports news that King Hussein had heard about the removal of Isa as ruler and expressed his concern that it could cause unrest. Arranged in chronological order, from earliest at beginning of file to latest at end. A bound correspondence file. The volume is foliated from the front cover to back cover, with small uncircled numbers in the top-right corner of each front-facing page. Some folios originally missed out have had letters added, e.g. 1a. 1b etc.